Each BRAMS station creates 288 files (of 5 minutes long each) per day. With approximately 25 stations in the network, the amount of files generated each day is of the order of 7000. With such a huge amount of data, an automatic method to count (and discriminate) the meteor echoes in the spectrograms is mandatory. A method is currently developed but must be validated on a large number of data. The goal is to obtain a statistically meaningful estimate of the false detections (e.g. 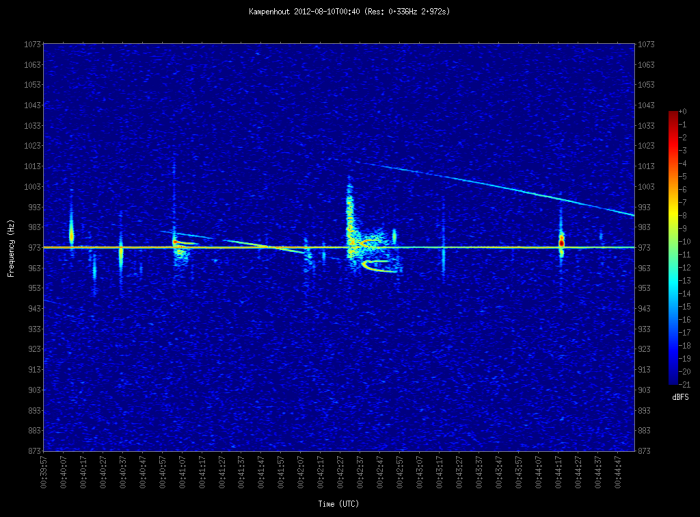 how many overdense meteor echoes are considered as several overdense and/or underdense echoes? 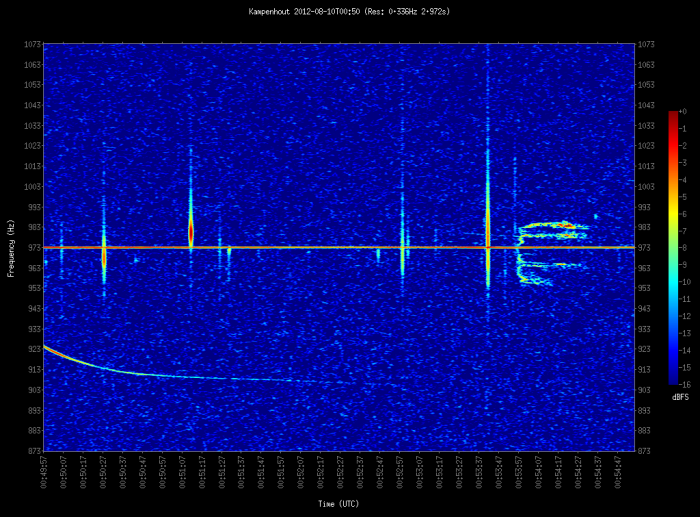 How many detections are due to spurious signals such as plane echoes or interferences?) and how many real meteor echoes are missed by the method? In order to estimate these values, we need to first make a manual count on a sufficiently large number of data. Of course, the manual count will be affected by human errors. In order to estimate these errors, we would like to have at least 5-6 different people counting the same data to give us an estimate of the spread in the counts. We are looking for volunteers to help us with this task. We selected 3 stations (BEUCCL, BEKAMP and BEOPHA) and two periods of 3 days (from 7 until 9 October 2011 and from 10 to 12 August 2012) to have a large sample of data including quiet periods (only background meteors), a very active meteor shower (Perseids peak in August 2012) and a very active meteor shower including a lot of special echoes (also called epsilon echoes, the Draconids peak in October 2011). For the test to be valid, everyone has of course to make the count on the same spectrograms that we will provide (those created by the BRAMS viewer). If you are willing to participate, we post below a link to a zip file with the spectrograms for one day and one station (288 files). We also provide a link to an excel sheet that you will have to fill in for that particular day and station. We just ask to make the count and discriminate between short (S) and long (L) echoes (see examples below). The goal is to have at least 6-7 independant manual counts for each day and station. Stijn Calders, Emmanuel Gamby and Hervé Lamy will do it for BISA. Once we have enough participants for that particular day and station, we will replace the files with the next one until all the counts have been made. You can of course make the counts for several days. If you want to volunteer and help us please download the files and send an e-mail to herve.lamy at aeronomie.be to let us know about your participation. Thank you! L = all the other meteor reflections. In this spectrogram 9 S echoes are visible, one clear L echo (at around 00h41m00s UT), one possible faint L echo (around 00h42m10s UT) and one L echo that could be considered as two (an overdense and a C-shaped echo starting around 00h42m35s). Of course, whether you will count or not the second L echo, or whether you will consider the last L echo as one or two is exactly the reason why we want to have several people counting independently. 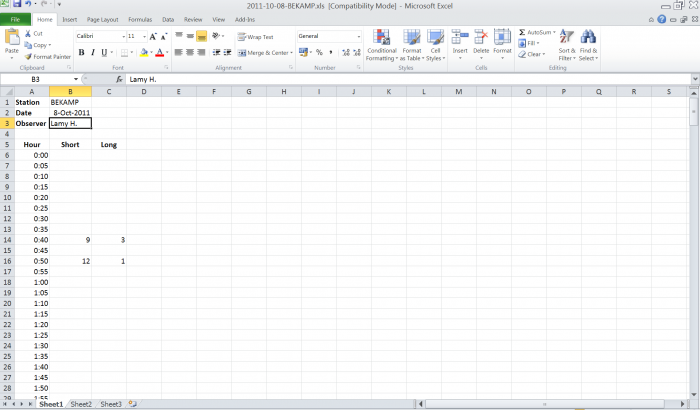 Below is an example of the Excel file to encode for the two examples given above (BEKAMP - 08/10/2011).